provide heating, cooling and natural light for your home. Solar electricity options are available to power home appliances and solar water heating can provide hot water options for laundry and general household water use (showers, cooking, cleaning). When planning a solar home it is important to consider which solar energy options are most efficient, and cost effective for your situation. A passive solar home utilizes home design to provide heating, cooling and natural light without the use of any special equipment. A passive solar home basically uses the environment to accomplish great reductions in energy use. A passive solar home uses construction materials and design to utilize the sun’s heat during winter months and block the sun’s heat during summer months. There are several passive solar techniques you can use in a solar home, direct gain, radiant heat from sunlight passing directly into a living space and being absorbed by furniture, flooring etc and usually achieved with south facing window installations, indirect gain, involving an attached Trombe wall that collects heat and distributes it throughout the home by the use of fans, thermal mass, which are materials that naturally collect and store heat such as brick or stone, and passive cooling, which generally includes overhangs for south-facing windows to block the sun during summer months for cooling the solar home. Another feature often found in a solar home is the use of solar electricity. Solar electricity is generated when photovoltaic cells are used to absorb sunlight and convert it into usable electricity. The energy produced by solar panels must be converted to DC (household power) through the use of an inverter. Solar electricity can be used to supplement metered electric already being received by a solar home or with the use of a battery storage bank, can be used as the only electric source for the home. If the later is going to be used, it is suggested that owners of the solar home have a generator available for backup power. Solar water heating is one of the most common uses of solar energy in a solar home. There are two kinds of solar water heating available for solar home use. The first is a closed loop system, which can be used in areas that are not prone to freezing. These systems use water filled tubes that are heated directly by the sun. A closed loop system uses an anti-freeze type liquid to collect heat from the sun and then the heated liquid is used to heat household water via a heat exchanger. Regardless of which steps you take toward converting to a solar home, energy efficiency is the most important attribute to a successful solar home operation. Energy efficiency minimizes the need for heating, cooling and electricity. Using higher insulation levels, more energy efficient windows, appliance and lighting than used in traditional construction, you will already be saving yourself a lot of money and energy. However these changes may not be an option when converting an existing home into a solar home, so make any changes possible to your home energy efficiency and adapt other solar practices to convert your existing home into a solar home. 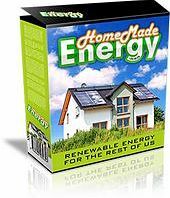 Save Money With Free Energy!